Swarnakamalam has been highly recommended by several readers and other friends, and I saw Bhanupriya’s dances in the film on Minai’s excellent blog. 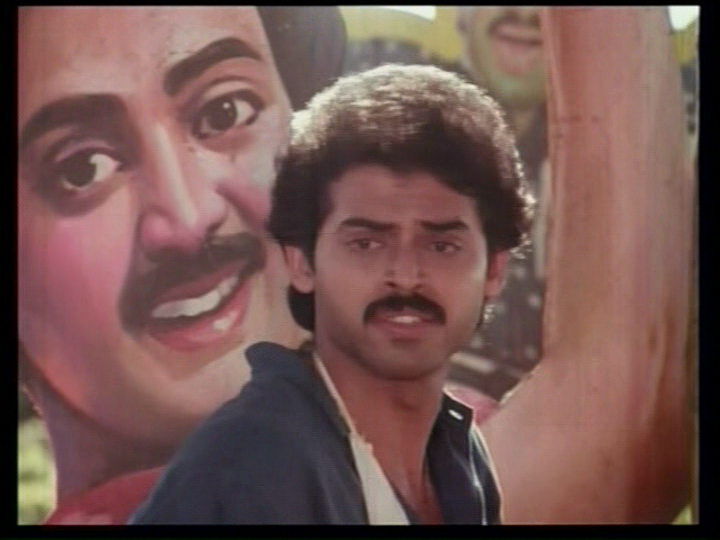 I really like Venkatesh and Bhanupriya. They are appealing, both are good actors, and I always enjoy seeing them on screen. K. Vishwanath wrote and directed, and while this contains several themes in common with his earlier Sagara Sangamam, this is a far less satisfying film. There is some great dancing and a nice domestic setting that helps build the sense of who these people are. But I don’t wholeheartedly like the lead characters and I have issues with several points in the story. My DVD is mostly subtitled but occasionally I guess the subtitle team nipped out for a coffee or something and a few chapters were left untouched. Happily these were mostly scenes involving Tinku the annoying child sidekick, but perhaps there was something essential that I did miss. Venkatesh is Chandrasekhar. He is introduced as an artist who paints cinema hoardings and billboards. He has a sidekick, annoying young Tinku, and seems to get by from day to day. He cons his way into renting a room from a pious couple, and initially his character seems to be a bit shady. But as time goes by he seems to have contacts all over town, knows everyone, and can facilitate pension and passport applications. Venkatesh is a really likeable actor. He always seems to be acting with his co-stars rather than acting for the camera, and I love watching him in ensemble scenes as he never seems to switch off when he is in the background. Although I did find myself thinking ‘Oh it’s a good thing his back-hair is distracting me from the too short shorts’. See if you agree! It’s a shame Chandrasekhar is quite unappealing once the superficial charm is taken out of the equation. He is controlling and a bit of a bully. He always knows best, and pushes people to do what he wants. He also seems to be quite obsessed with Meenakshi and paints multiple hoardings with her image, and has loads of photos of her strewn about his studio which is a bit creepy. From his rooftop terrace he can see into his neighbours compound. 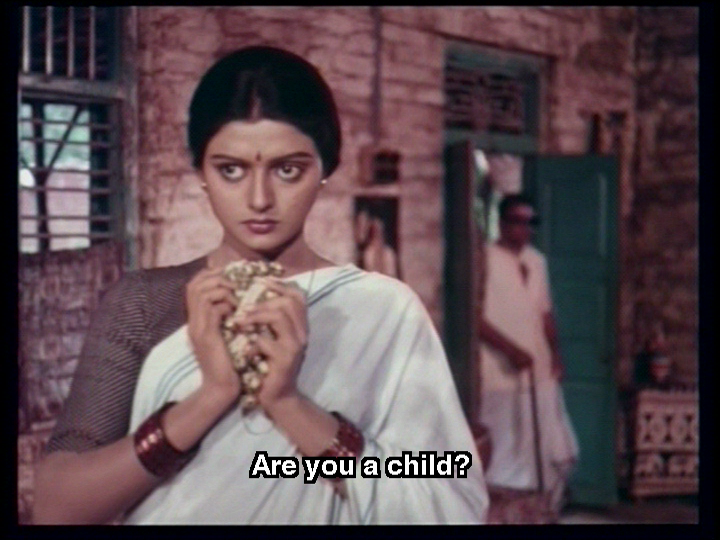 Bhanupriya is Meenakshi, the girl next door. She is the daughter of a celebrated dance guru, and lives in genteel poverty. She doesn’t see the point of dance as it doesn’t put food on the table. Her sister Savitri (Devilalitha) works tirelessly making and selling snacks, and singing with their father. Meenakshi just wants to escape the artistic life and get a job that pays for life’s necessities and a few luxuries. Of course, everyone around her seems to know better. Even allowing for the pressure, Meenakshi is a brat, and seems like a very young teenaged girl. She is sly, sneaks off to the movies and other outings, and tries to get out of dancing by staging various misfortunes but never speaks to her father about her reservations. Once her father passes away, Meenakshi gets a job and seems to be set to stand on her own feet and live the life she wants. She is strong enough to confront Chandrasekhar about his actions but not strong enough to stop him from interfering. Bhanupriya is beautiful, and I loved the songs that featured her excellent dancing. But there was something about Meenakshi that I just couldn’t like as much as I wanted to and I blame that on the writing for her character. This is one of my favourite songs. I enjoy the way Bhanupriya is initially cranky about having to practice but seems to enjoy dancing more as the audience builds. The supporting cast are mostly members of the household or compound. There is a pleasantly disorganised informality in the way characters wander in and past each other’s houses and share chores. I loved the set dressing that included little details like the knick knacks in the house. Savitri and the landlord’s son have a nice romantic sideplot that made me happy as theirs seemed like a genuine partnership founded on mutual affection and respect and they were nice people. 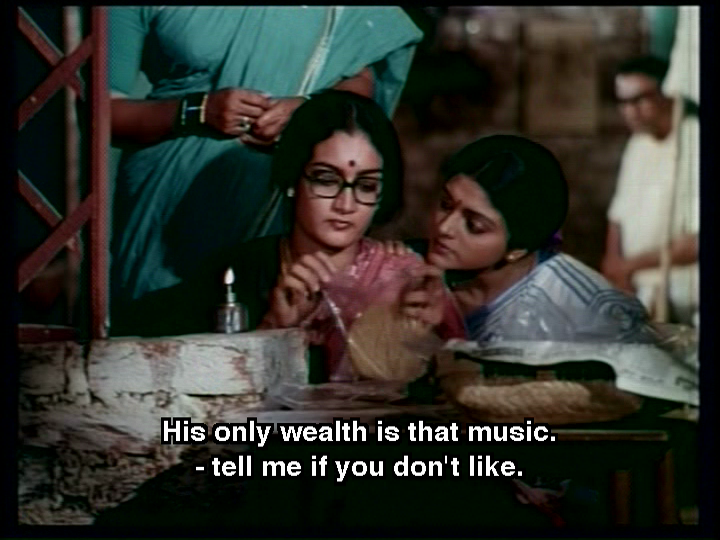 There is a comedy sideplot involving Sri Laxmi and her unfortunate husband, and it was tolerable if not hilarious. Tinku, the annoying child sidekick, does have some nice scenes where he is copying Meenakshi’s dance, and becomes very focussed and joyful. The uplifting power of music and dance permeates the film. Director K Viswanath is known for his message films. But the message in Swarnakamalam seems to get a bit scrambled. Initially we are presented with the ideal of classical art, pure and beautiful. Bureaucrats are criticised for not paying pensions to senior artists and giving them their due respect. But then the message seems to be that art cannot be forced, it must come from the heart and be allowed to adapt lest it stagnate, so there is approval for Meenakshi’s rejection of her artistic heritage. Then Chandrasekhar decides that Meenakshi is born to be a classical dancer despite her own views and badgers her into performing, has her fired from a job she enjoys as it is supposedly beneath a great dancer and generally insists she be his perfect artist according to the ideals of culture and tradition. Meenakshi wants to dance when and as she feels like it, not as her whole life or for her living. She is railroaded into becoming a cultural performer in a fancy hotel and then Chandrasekhar sets her up with a wealthy American dancer and patron who wants Meenakshi to tour the US. After a very emotional scene where she learns to value her father’s legacy and embraces the dance, admitting that dancing with love and commitment would make her happy and fulfilled, she is forced to choose between Chandrasekhar and success. Chandrasekhar wrote Meenakshi a letter to read at the airport as she was about to set off on tour. He writes that no one else but him would ever tolerate Meenakshi’s lying and misbehaviour, no one else but him would force her to be a great dancer and every time her anklets chimed that was his voice, the voice of a man who loved her. I found it really manipulative in forcing a choice that didn’t have to be a choice. Why shouldn’t she have love and artistic success? So the whole great art as its own reward idea seemed to go out the window, as did the independence of the artist. The message seems to be it’s OK to stalk someone, then bully them into a career they don’t want, until they realise they do want it, then you pull the rug out from under them. Venkatesh and Bhanupriya did have a lovely rapport on screen, but my liking for their performances is just for their acting, and not the characters behaviours. On a purely visual level, Swarnakamalam is gorgeous. The songs are delightful, and allow Bhanupriya to show off her skills and a range of beautiful classical dance costumes, and Venkatesh shows off his strolling and knitwear modelling in some beautiful locations. 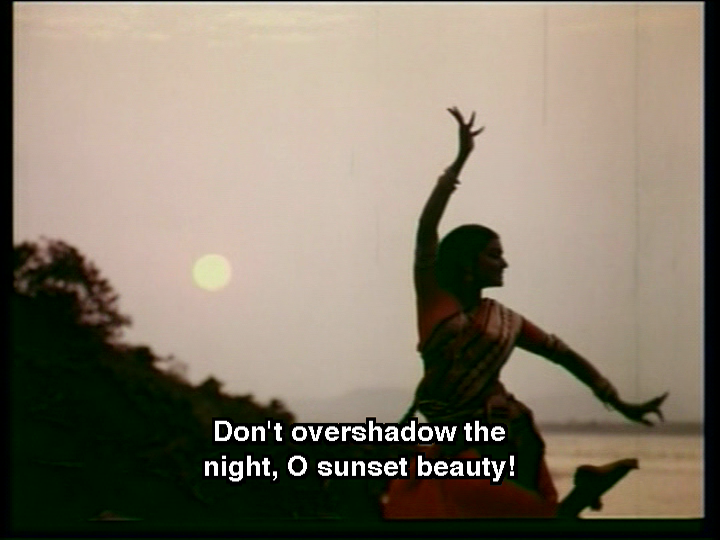 The framing of the dance scenes is meticulous and Lok Singh made the most of the scenery and the beautiful lines of Bhanupriya’s dancing. The music by Illayaraja is perfect for the context and the subtitles for the songs did offer some additional insights as well as being lovely. Watch it for excellent performances and beautiful dancing, sadly not matched by the story or characters. I just can’t warm to the film, but I love the songs. 3 stars. Heather says: This is a beautifully pictured film which focuses on the art of Indian Classical dance and to a lesser extent Carnatic music. I love the two sisters, Meenakshi and Savitri, and their very genuine interaction. It makes it very natural that the only person Meenakshi conveys her discontent to is her sister. Savitri’s placid nature means that she is happier and more settled, but she accepts Meenakshi’s view and does her best to help her attain her dreams after their father dies. This relationship and that of the two girls with their father makes a very solid foundation to the film. Enter Venkatesh as Chandrasekar – the interfering neighbour. 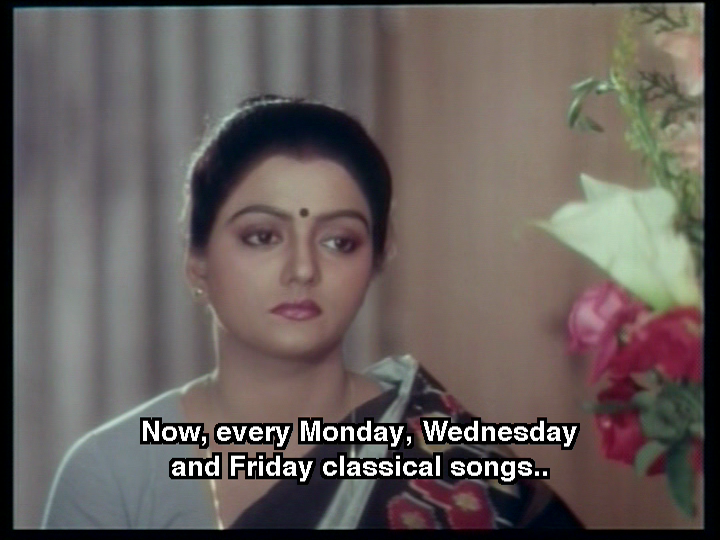 If I was Meenakshi, I don’t think I would have had as much patience with Chandrasekhar’s meddling in my life. Although it’s clear that he has her best interests at heart he is determined to make her conform to his view of her. The film tries to point out that you have to have passion and belief in order to truly excel, and I’m not sure that Meenakshi really does have what it takes. She enjoys dancing for herself but doesn’t enjoy performing so it does seem cruel that everyone keeps forcing her, when all she wants is a normal life. 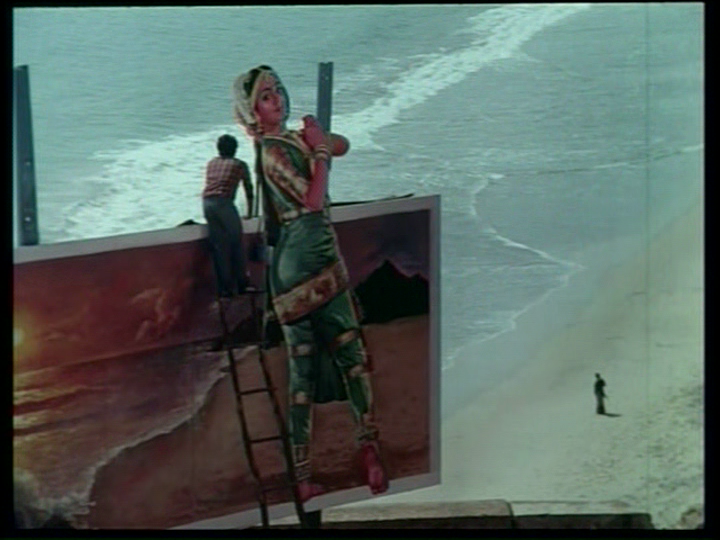 I also agree with Temple that it was very stalker-ish for Chandrasekhar to paint her picture everywhere. I found that really creepy, especially considering that he was essentially also watching her all the time. Savitri’s relationship seems much more genuine and is more enjoyable to watch develop. Top marks as well for showing the landlord’s son playing the violin properly. It makes me cringe every time I see someone massacring a violin on screen and this is a lovely change. Even if he isn’t actually playing the notes that we heard! Despite my quibbles with Chandrasekhar’s character, I thinkthatVenkatesh was excellent in this role. He was passionate and devoted and really looked the part. Due to dodgy subtitles I didn’t get a clear idea of his relationship to Tinku but it was effective to have the comedy mainly between Chandrasekhar and Tinku rather than the usual obtrusive and subsequently unfunny ‘comedy track’. The humour between the couple with the wife devoted to blessing everyone was also funny and well integrated into the movie. 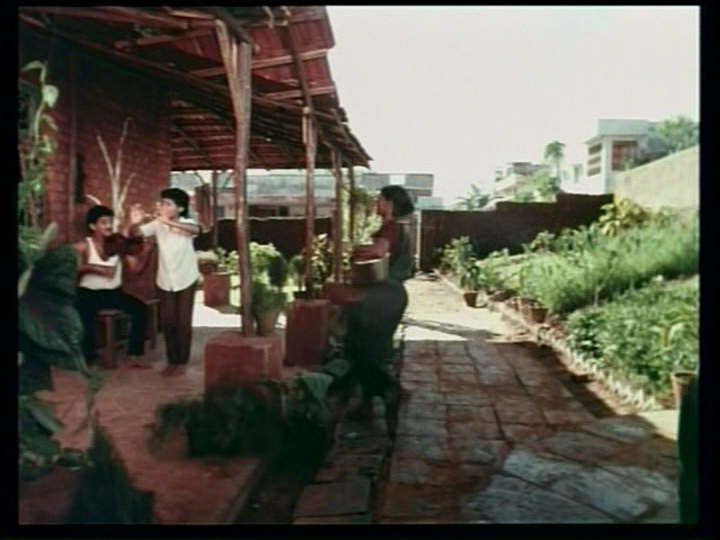 The standout of the film though is the dancing, and Bhanupriya was fantastic in these scenes. It was interesting to have real life dance guru Sharon Loven in the film, although her character didn’t really make much sense in the context of the rest of the story. The whole trip to America idea felt tacked on as a reason for Chandrasekhar and Meenakshi to finally admit what they felt for each other. I have 2 copies of this film and since they both had patchy subtitles and wouldn’t play right to the end I was quite frustrated by the time Meenakshi left for the airport. I watched the climax online with no subtitles and would love to know what was written in that last letter since Meenakshi’s decision at the end might make more sense to me. I was hoping she would leave and make a life for herself in America where she would finally be able to choose to do what she wanted to do. Still, the film looks beautiful and both the dancing and the music are excellent. Worth watching for those alone. 3 ½ stars. This entry was posted in Tollywood and tagged Bhanu Priya, Bhanupriya, Devilalita, Devilalitha, Illayaraja, K. Vishwanath, Lok Singh, Shanmukha Srinivas, Swarnakamalam, Telugu, Tollywood, Venkatesh, Venky. Bookmark the permalink. I remember liking the first half of the movie much better than the second half. Bhanupriya’s antics in trying to get out of her dance practice and schedule were very relatable for anyone with strict parents and living in such a close community. Talking to parents (especially to father) about one’s dislikes is just not done. The second half just goes downhill trying to do too many things too fast. I think the story couldn’t decide if it wants to be a love story or an art story. I’m so happy to be seeing more posts about this film because it gets discussed so little online! Bravo on a great post which hit on all the things I dislike about the film as well as the positive things. It’s so nice to see someone mentioning the negative things about this film instead of endless praises! I especially loved your mention of the way the characters wander into each other’s houses and the set details of the homes- this was what struck me the most when I first watched the fim. Everything was so earthy and lived in. I agree with your assessment of Chandrasekhar’s character- I hated him with a passion! 🙂 Especially how he did his relentless pushings all so nonchalantly. I remember in the scene where he gets Meenakshi fired from her hotel job he just sits there with this mildly amused expression on his face- I just wanted to smack him! And I really wanted to smack him in the scene in the rain when Bhanupriya confronts him. Couldn’t he address her concerns at all instead of blowing her off and offering her tea? I didn’t have subtitles on my DVD at the end so I was very incensed to read your translation of the letter! That makes me hate his character even more, ha! What also creeped me out about the scene where Chandrasekhar got Meenakshi fired was the way he was holding a cut-out photo of her, and handed it over to the manager. They were sort of passing her back and forth and I wondered if there was some implied criticism of his behaviour but no … I’ve read a couple of reviews since writing this that hold Chandrasekhar up as the ideal husband and it really makes me wonder if we saw the same film! I think Tinku’s parents (whoever they were) were probably better off without him prancing around being precocious and bouncy. I am glad I have this film and I have watched it several times (with a bit of fast forwarding on the repeat views). I’ve recommended it to a couple of friends but with a mild caution about the story. I was on IMDB looking at works of director Vishwanath, clicked on movie Swarnakamalam to read some trivia and saw this link for review. After reading the posts, my basic question is are the reviewers non Telugu speaking and not raised in India? Maybe this website is for such readers? To really understand this film one needs to grasp the 1980s time period this movie depicts, when common man started to lose interest in India classical art/culture and started to adopt Western art/culture as superior. Most of Vishwanath’s movies are about this concept which is beautifully depicted in the movie. In this generation or to non desi folks, Chandhrasekar’s behavior may look very insensitive and intruding into life of Bhanupriya, but if you look at it in context and with Indian cuture of 1980s in mind, it really isn’t so! More so if you realize many things that we consider now as improper were just fine back then, like him putting cutouts of her which the father considers an honor much less intrusion of privacy. We (including myself) sympthathize with Bhanupriya more than side with Chandrasekhar because we belong to newer generation where we don’t really understand what is the big deal if a talented dancer with acclaimed guru as father doesn’t do justice to her abilities. Chandrasekhar chooses to save the art in his lover at the expense of his love, ignoring the fact she hates him more as he tries to save more of it. The conclusion of the movie isn’t done in a satisfying way, seems a bit abrupt. By the way Tinku character (played by Shanmukha Srinivas) is very likeable, amusing and enjoyable; I don’t understand why anyone would feel otherwise. If you see Vishwanath’s other movie Sruthi Layalu, he’s awsome in it, dancing, singing and playing instruments very well (in real life too). Hi Falcon. In answer to your question, I am not Indian and do not speak Telugu 🙂 But this blog is not really written for a specific geographical audience, and in fact the majority of readers seem to be based in India. One of the things Heather & I discovered when we started watching South Indian films in particular was that there is not a lot of information available in English, and very little that isn’t aligned to one fan group or another. It’s not helpful to the new fan when you’re trying to learn more, or track down more films to watch. So this blog captures our thoughts on what we find noteworthy, and lets us share what we learn along the way. There are quite a few film bloggers from outside India who write about Indian cinema (Hindi, Telugu, Tamil and other regional languages) and it’s a very active and interesting blogging community. If you liked this movie I highly recommend other movies directed by K. Vishwanath like Swathimuthyam, Saagara Sangamam (my personal all time fav) and Sruthilayalu. I hope English subtitles for these movies are good. All his movies feature lot of South Indian art, dance, culture with excellent plot and acting. I wish there were more directors in Telugu Film Industry like him, who are willing to take some risk to make good movies, than just commercial hits. I have watched Sagara Sangamam and written about it – although at that time I didn’t have a subtitled copy so I had to make a few guesses. 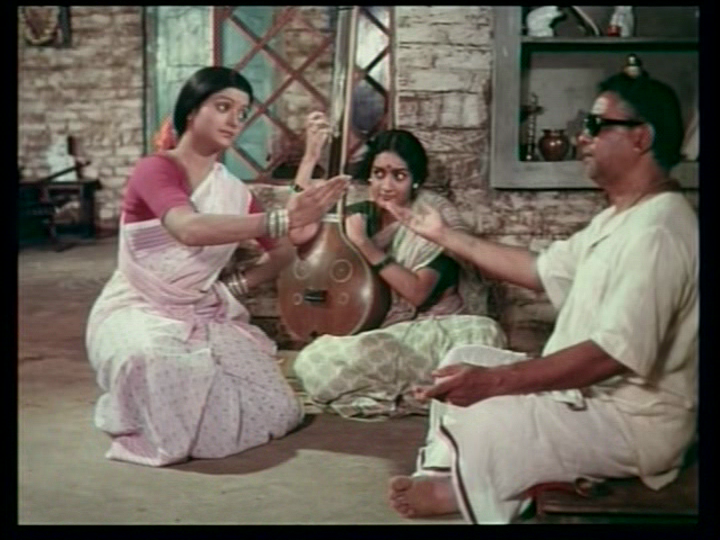 I like K Vishwanath’s films but they can be a little heavy handed so I leave some time between watching them. Otherwise they can be a bit repetitive, although well made. Sagara Sangamam is a favourite, particularly for the wonderful dancing. I think there are interesting directors around in the Telugu industry – I’ve enjoyed films by Anish Kuruvilla, Sekhar Kammula, Mohan Krishna Indraganti and Krish among others that I wouldn’t describe as totally commercial. Even Sukumar who is quite successful and mainstream has taken a slightly different approach on some projects. But there is always a place for fun and entertainment! I think the commercial directors have their place. Certainly the South Indian film technicians seem to be very talented so the mass spectacular films are often very well executed. 25yrs since this movie released..